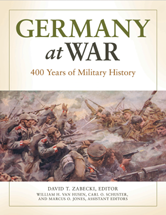 This landmark, four-volume encyclopedia explores how and why that happened, at the same time examining Germany as a military power from the start of the Thirty Years' War in 1618 to the present day. Coverage includes the Federal Republic of Germany, its predecessor states, and the kingdoms and principalities that combined to form Imperial Germany in 1871. Opposition to the Peace Resolution: Field Marshal Paul von Hindenburg, Telegram to His Majesty the Kaiser and King, Wilhelm II, July 12, 1917, 6:25 p.m. The Hossbach Memorandum, Berlin, November 10, 1937: Minutes of a Conference in the Reich Chancellery, Berlin, November 5, 1937, from 4:15 p.m. to 8:30 p.m.